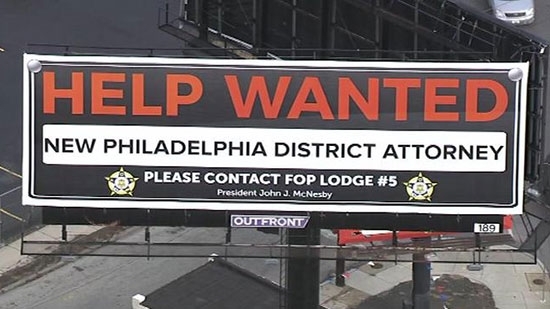 The Philadelphia Police Union, Fraternal Order of Police Lodge #5, has purchased a billboard along I-95 to express it's dissatisfaction with Philadelphia District Attorney Seth Williams. The sign reads, "Help Wanted. New Philadelphia District Attorney. Please contact FOP Lodge 5." You can see it from the northbound lanes at Aramingo Ave between between Bridge Street and Cottman Avenue. The union has been critical of Williams in the past but this time it is in response to the $62,000 settlement he has agreed to pay after the Philadelphia Board of Ethics found he failed to disclose $175,716 in gifts and several sources of income in his statements of financial interests. FOP president John McNesby said, "If it would have been any other city employee, they would have been fired." The union plans to endorse one of the other candidates running for the office ahead of the May 16 primary. They'll be distributing lawn signs similar to the billboard across the city. Hundreds of local students in Philadelphia marched for women's rights and to advocate for the Equal Rights Amendment ahead of the Presidential Inauguration tomorrow. The march started at 11:30 a.m. at City Hall before marching through Center City up Ben Franklin Parkway and ended at Eakins Oval for a rally. Students from more than a dozen schools attened. Anna Holemans, a junior at Friends Select School, organized the event over a year ago. They are calling for the passage of the Equal Rights Amendment, first introduced in 1923, that would guarantee women equal rights under the law. A Women's March will be held in Washington, D.C. on Saturday. A man has died after a physical altercation with a Philadelphia Police officer on Thursday morning. It happened around 5 a.m. Thursday on the 900 block of Poplar Street. Police responded to a call for a “person screaming.” The 55-year-old man was jumping up and down on his red truck and yelling. He then approached the driver side of the patrol car, reached in, and grabbed the female officer by the neck. A struggle ensued and another officer hit him with a baton and a taser was used. After they got him to the ground and handcuffed him they noticed the suspect was unresponsive. They rendered aid and administered a dose of Naloxone, believing he was overdosing. The suspect was taken to Hahnemann University Hospital where he was pronounced dead. Hospital staff noted that the taser barbs never penetrated the man's skin. The cause of death has not been determined. The officer suffered minor injuries. Homicide and internal affairs will be investigating the incident.